The discharge of untreated sewage in controlled or territorial waters is usually banned by legislation. International legislation is in force to cover any sewage discharges within specified distances from land. As a result, and in order to meet certain standards all new ships have sewage treatment plants installed. Untreated sewage as a suspended solid is unsightly. In order to break down naturally, raw sewage must absorb oxygen. In excessive amounts it could reduce the oxygen content of the water to the point where fish and plant life would die. Pungent smells are also associated with sewage as a result of bacteria which produce hydrogen sulphide gas. Particular bacteria present in the human intestine known as E, coli are also to be found in sewage. The E. coli count in a measured sample of water indicates the amount of sewage present. Two particular types of sewage treatment plant are in use, employing either chemical or biological methods. The chemical method is basically a storage tank which collects solid material for disposal in permitted areas or to a shore collection facility. The biological method treats the sewage so that it is acceptable for discharge inshore. This system minimises the collected sewage, treats it and retains it until it can be discharged in a decontrolled area, usually well out to sea. Shore receiving facilities may be available in some ports to take this retained sewage. This system must therefore collect and store sewage produced while the ship is in a controlled area. The liquid content of the system is reduced, where legislation permits, by discharging wash basins, bath and shower drains straight overboard. Any liquid from water closets is treated and used as flushing water for toilets. The liquid must be treated such that it is acceptable in terms of smell and appearance. Various chemicals are added at different points for odour and colour removal and also to assist breakdown and sterilisation. A comminutor is used to physically break up the sewage and assist the chemical breakdown process. Solid material settles out in the tank and is stored prior to discharge into the sullage tank: the liquid is recycled for flushing use. Tests must be performed daily to check the chemical dosage rates. This is to prevent odours developing and also to avoid corrosion as a result of high levels of alkalinity. The biological system utilises bacteria to completely break down the sewage into an acceptable substance for discharge into any waters. The extended aeration process provides a climate in which oxygen-loving bacteria multiply and digest the sewage, converting it into a sludge. These oxygen-loving bacteria are known as aerobic. The treatment plant uses a tank which is divided into three watertight compartments: an aeration compartment, settling compartment and a chlorine contact compartment . The sewage enters the aeration compartment where it is digested by aerobic bacteria and micro-organisms, whose existence is aided by atmospheric oxygen which is pumped in. 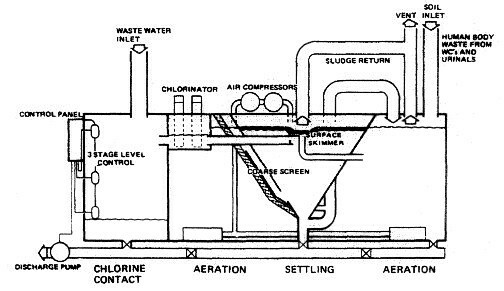 The sewage then flows into the settling compartment where the activated sludge is settled out. The clear liquid flows to the chlorinator and after treatment to kill any remaining bacteria it is discharged. Tablets are placed in the chlorinator and require replacement as they are used up. The activated sludge in the settling tank is continuously recycled and builds up, so that every two to three months it must be partially removed. This sludge must be discharged only in a decontrolled area.